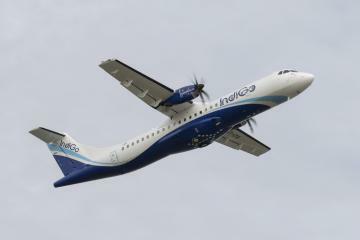 IndiGo, India’s largest airline by market share, happily took delivery last week of its very first ATR 72-600. It seems like only a few months ago the carrier and ATR announced the deal for 50 ATR 72-600s. The delivery last week represents a major step in the airline’s ambitious plan to further develop its fleet with the introduction of fuel-efficient and cost-effective ATR 72-600s, thus expanding its regional fleet network and bringing air connectivity to smaller less well served Indian airports and communities. The introduction of the new ATR fleet goes in line with the Indian government’s Regional Connectivity Scheme, which aims to boost economic development, employment and tourism by connecting small and remote cities. Under this scheme, 100 new airports are expected to be created in the next three years. The ATR 72-600 is the most popular regional aircraft in its category. Its unbeatable economics and operational versatility at small airfields make it the perfect tool to support IndiGo’s plans to build its regional network in India. The ATR 72-600s feature seat and trip costs that are respectively 10% and 20% lower than those of other in-production turboprops. They also feature the most modern cabin interiors, specifically designed for ATR by the Italian firm Giugiaro, with thinner seats, larger overhead bins and LED lighting for an optimal passenger experience. With its new ATR 72-600s IndiGo will be able to offer their passengers affordable fares, while opening new routes throughout the country, thus contributing to developing local economies and strengthening social links. 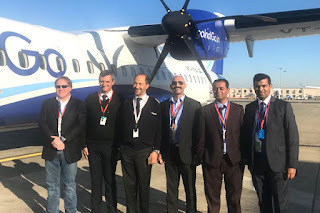 Aditya Ghosh, President of IndiGo, said: “By taking delivery of this first ATR 72-600, we are now one step closer to the launch of our Turboprop operations by the end of this year. We are excited at the opportunity of once again being able to redefine air travel in India by bringing the reliability and efficiency of IndiGo’s operations to towns and regions in our country which so far have been devoid of reliable air service or have been subject to exorbitant airfares. My sincere thanks to the team at ATR. As we say at IndiGo, we are all set and TURBOCHARGED!”. Christian Scherer, ATR’s Chief Executive Officer, stated: “IndiGo is a much respected airline which pays particular attention to every single detail relating to quality. Today’s delivery to such a renowned airline underlines the quality and the suitability of the ATR -600 and shows why it is unrivalled in the regional market. IndiGo’s choice highlights their commitment to offering passengers only the very best at the lowest cost possible. India’s rapidly expanding domestic market represented close to 100 million passengers last year and has been steadily growing by more than 20% annually. As the country is expected to become the world’s third-largest market by 2020, we are proud of playing a key role in such an expansion of the air connectivity”. IndiGo is also talking with fellow European aircraft manufacturer Airbus for the possible purchase of at least 50 wide-body aircraft for further development of a long-haul route network rather than taking over Air India's long-haul operations.